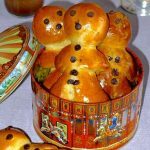 It was not planned that way, but this special “Saint Nicolas” week will be quite focused on the traditions from the East of France. In fact, when we chose the festive theme for this week, I started my research in the Central European countries that celebrate this Christian winter festival, including the Netherlands, Germany, Belgium, Switzerland and Austria. 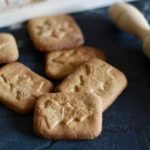 When I shared my first choice to my wife Anne, she stopped me right there and immediately kindly asked me to change it to the Saint Nicolas gingerbread cookies, sweet memories of her childhood in Lorraine, in the East of France. I am publishing this recipe 6 days before the Saint Nicholas holiday so you can have time to prepare your gingerbread cookies before December 6th, which falls on a Saturday this year. When I spoke to Anne about Saint Nicholas, I immediately saw her eyes light up and she started to share with me her memories of the Saint Nicolas processions in the city of Nancy, but also gingerbread cookies with images of the famous Bishop that were even served at the school cafeteria during the month of December. Saint Nicholas lived in Myra, an ancient Turkish city now called Demre, in the peninsula of Anatolia. He died on December 6th and his tomb became the site of many miracles. Much later, some of his relics were returned to Bari by Italian soldiers. These relics have also contributed to many miracles in Italy. A few years later, a Knight from Lorraine who was passing through Bari, stole one of the Saint’s finger bones and brought it with him to his hometown Saint-Nicolas-de-Port, right outside of Nancy. A number of miracles happened over there too even though the legends got lost over the centuries. Only one legend remained, that of the children who got abducted and killed and that Saint Nicholas returned to life. A rather sordid history which remains until today with the relatively recent arrival of the “companion” of Saint Nicholas called Pere Fouettard. Pere Fouettard is an iconic character of this Christian festival, which symbolizes evil and punishment. Indeed, if Saint Nicholas rewards good children, Pere Fouettard, known by various other names in surrounding countries punishes disobedient children… I am seriously thinking about sending my kids to their grandparents in Lorraine to teach them a lesson! It is during the night of December 5th that Saint Nicholas rides his mule to distribute gifts to children. Reminds you of another story of an old man in a red cape? No, Superman is not that old, I am speaking of course of Santa Claus on his sleigh pulled by reindeers. So how did Santa Claus steal the show to Saint Nicholas, who was celebrated long before the white bearded guy was made famous by Coca Cola? It is only after the Protestant reform of the sixteenth century that the celebration of Saint Nicholas was abolished in most European countries except the Netherlands. Indeed, the Dutch continued to celebrate Sinterklaas in Amsterdam the night of December 5th. Some even claimed to have seen the real Saint Nicholas but we’re not sure of what they smoked. In the seventeenth century, the Dutch migrated to the United States and founded New Amsterdam, later named New York. In the decades that followed, this festival spread all across the United States and Sinterklaas became Santa Claus. Subsequently, the Christian Church found it more appropriate to combine this children holiday with that of the divine child. Thus, Santa Claus began to make its rounds to reward good children on the evening of the 24th, the eve of baby Jesus’ birthday. But back to the Lorraine tradition. It appears that these gingerbread cookies are well known in Lorraine but also in Alsace. 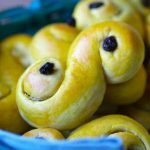 In a few days, Vera will actually tell us the story of those typical Alsatian buns called mannele or mannala which are also representative of the holiday of Saint Nicholas. When my wife Anne shared with me her desire to taste those Saint Nicholas gingerbread cookies again, I started my research and I very quickly found Aurélie’s blog, Mademoiselle Cuisine, which not only proposed the recipe with all the tips, but also a template (for those like me who do not have a Saint Nicholas cookie cutter) and images to be printed and placed over these cookies. It was a fortunate discovery as I looked for those Saint Nicholas cookie cutters but could not get any delivered to Los Angeles in a timely manner. Aurelie’s template is perfect to help cut the dough to the shape of the Saint Nicholas cookie. And her guidance for the icing were also perfect… if I had read them. Indeed, I am not at all a fan of frosting and I almost never make any. Icing is actually nothing more than whipped egg white and icing sugar. Only thing I should have done was to add a little water to it as it was a tad difficult to spread it on gingerbread. I’ll know for next time, if there is a next time. 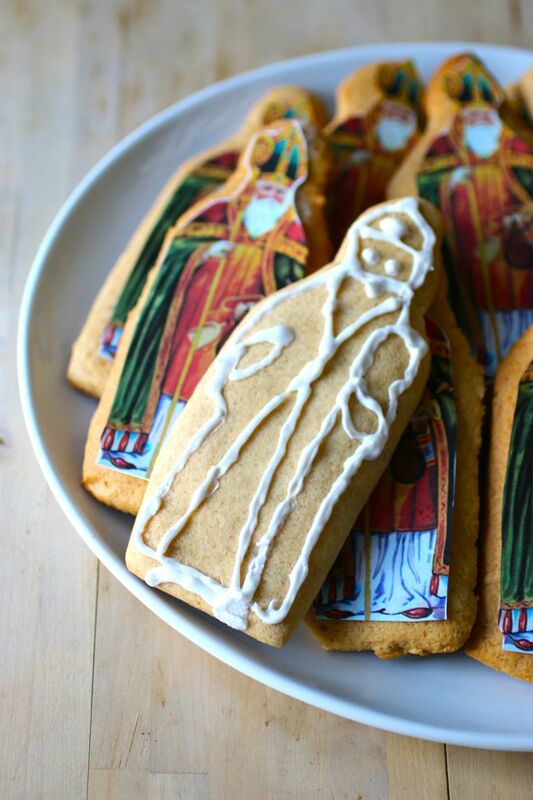 In terms of taste and texture of these Saint Nicholas gingerbread cookies, my wife told me they were perfect and authentic. They definitely reminded her of her childhood. She even showed them to her parents via Skype and they were quite impressed. Our children even asked for more. 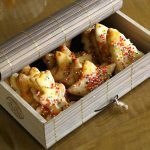 And even if our children loved these little Saint Nicholas gingerbread cookies, I think they still prefer to celebrate Chanukah. It is an easy choice between one gift on the 5th or 8 days of gifts throughout the Jewish holiday! 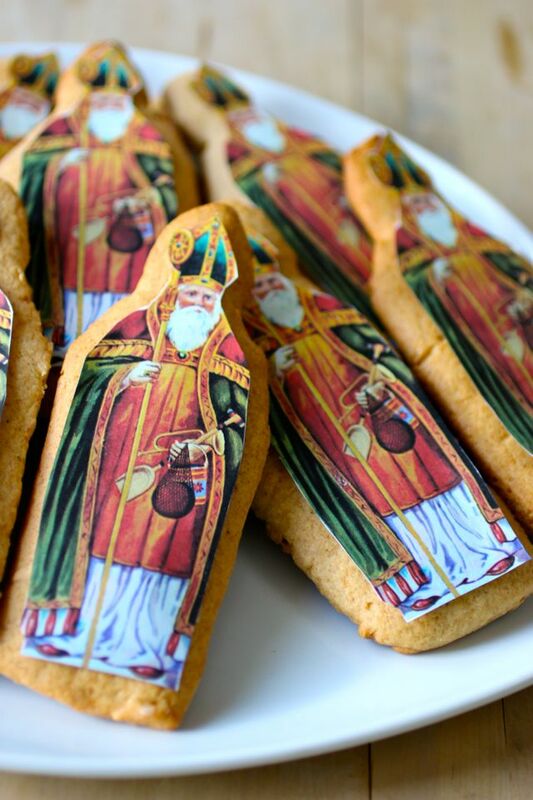 Those very visually appealing Saint Nicholas Gingerbread Cookies are a famous tradition in the East of France, specifically in Lorraine and Alsace. Pour the spices in a bowl. Add flour, baking powder and sugar. Mix. Add honey. Knead the dough by hand or with the food processor. Add half of the water. Continue to knead the dough without adding the remaining water even if it may seem a bit dry at first. After a few minutes, add the remaining water, if necessary. The dough should not be sticky. If this is the case, add a little flour. Form a ball with the dough, cover with plastic wrap and set aside for at least 1 hour at room temperature. Roll the dough to about ⅓ inch thick on a floured work surface. Cut out shapes with cookie cutters or a knife with the help of the template indicated in the notes. Arrange the gingerbread on a baking sheet lined with parchment paper, leaving enough space between them. Prepare the frosting by mixing the icing sugar and egg white. 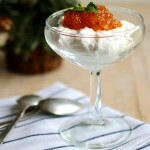 Whisk the mixture with an electric mixer until reaching a smooth, bright and very white cream. Add a little water if the frosting is not thin enough. Decorate with a pastry bag or a squeeze bottle. 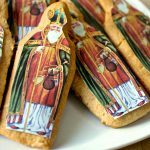 For the gingerbread cookies that will be covered with the Saint Nicolas printed image, spread some icing on the gingerbread in a zigzag shape as it will act as a glue. 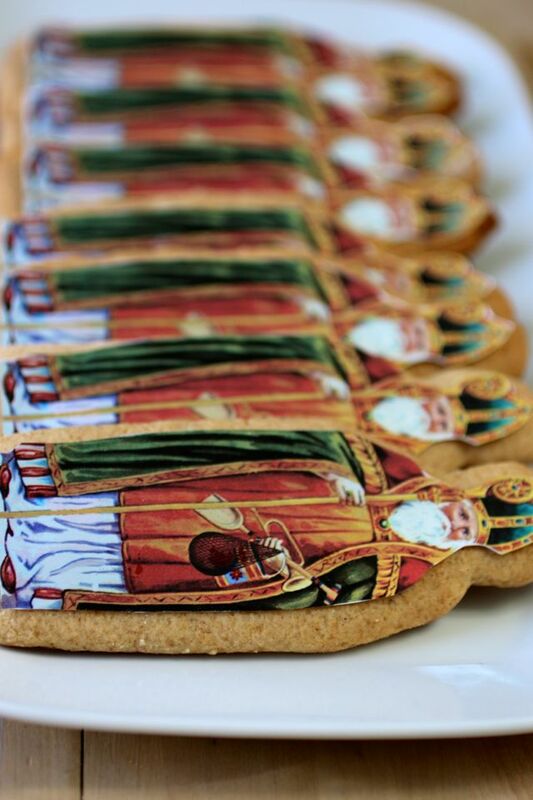 Place the printed image on the Saint Nicolas gingerbread cookie when the icing is still fresh. You can find the template for the Saint Nicolas images here. 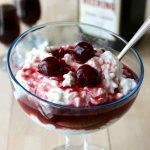 What a delicious recipe, but can I just say I loved your history lesson included! I am a former history teacher and I miss it greatly sometimes. I loved reading your post and looking forward to many more. Well I have subscribed, so I will look forward to seeing what else you come up with! What a great recipe! I live in the Netherlands, just along the border of Germany and we certainly see many cookies like this. The smells and taste are just amazing! I love how you decorated these! What a great and delicious way to celebrate this Saint.